What have we been up to….children’s baking! 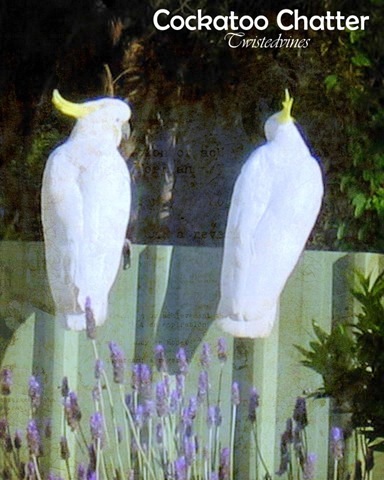 The Sulphur-crested cockatoo can be found widely north and east of Australia, and actually right at our back door.Their distinctive raucous call can be very loud, repeat very loud. 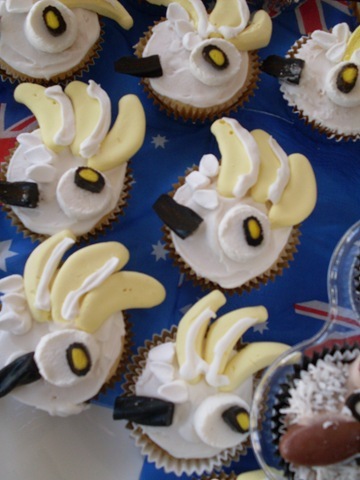 So, with a bit of detail, we made cockatoo cupcakes…cupcakes were a basic vanilla mixture covered in assorted lollies: banana’s,licorice,marshmallows and vanilla frosting. 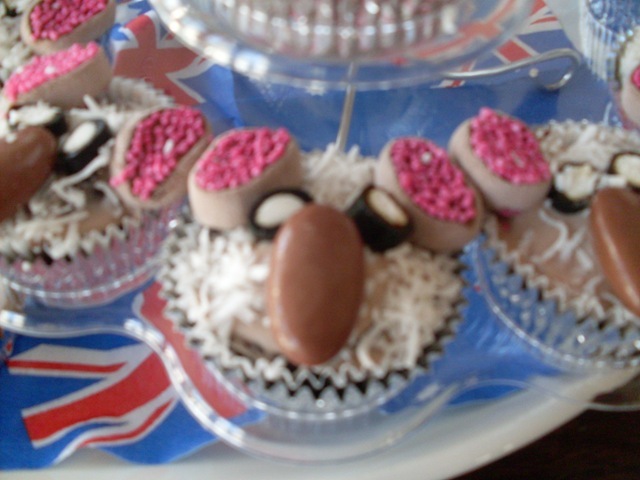 Chocolate cupcakes with choc frosted icing, sprinkled with coconut, and covered in marshmallows,licorice,and clinkers. Indication of happy children…an empty plate! 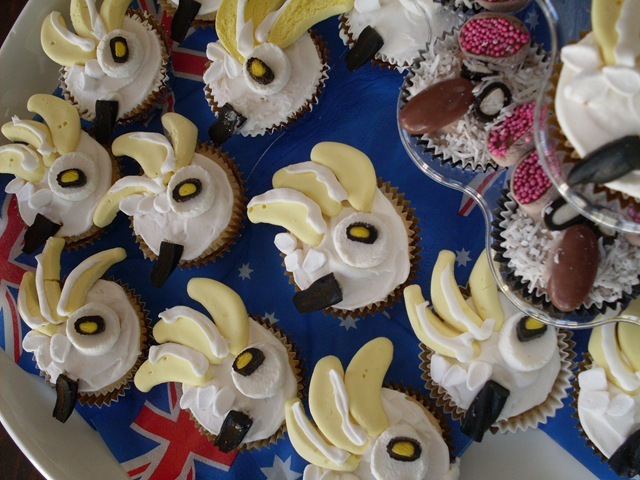 Love both cupcakes but the cockatoo-inspired are my faves. (I’m a bird person.) 10 years ago, while researching birds & parrots, I considered getting a cockatoo — for about 5 minutes. Once I learned how loud they can be, I started looking into other birds. They sure are beautiful, though — just like your cupcakes! They are very loud, and usually fly around in groups, around home there’s a feeding tray, so often there are 6-8 cockatoos who visit often.There’s are constant chatter! 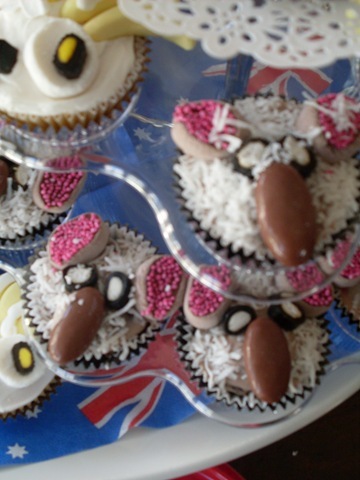 Thanks jeanetteann, they were a lot of fun to make…. Sooo sweet, Yvette, in more ways than one. Your niece’s friend will remember this for many years to come. What a nice farewell, and how fun! Those banana sweets have just brought back so many memories from when I was little. I loved them (and the pink shrimps too). What great cakes. I am searching for cupcake ideas for our sons adoption celebration in a few weeks time and I think I may have found a contender. Absolutely exquisite Yvette – they are both brilliant! Easy to see why the kiddies loved them so much! I just love the cupcakes and the children must have been thrilled. Oh what FUN! 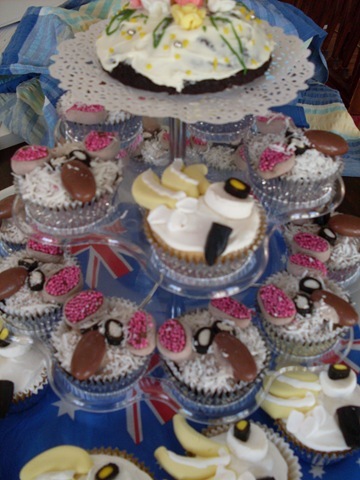 What a sweet celebration for your neice’s classmates~ I’m sure they were in cockatoo & koala cupcake heaven! I can only imagine how long it took you to try visualize the cookies and cupcakes to make them look like the coockatoo and koala. Not to mention to actually bringing them together and make them work!